Camp Stone is a timber frame house plan design that was designed and built by Max Fulbright. Unbelievable views and soaring timbers greet you as you enter the Camp Stone. This home can be built as a true timber frame or can be framed in a traditional way and have timbers added. The family room, kitchen, and dining area are all vaulted and open to each other. The master bedroom is also vaulted and has great views off the rear of the home. The master bath has double sinks, a walk in shower, and a large walk in closet. A mud room, pantry, and laundry room complete the main level. The lower level features a huge recreation area, four bedrooms, two baths and a walkout basement. 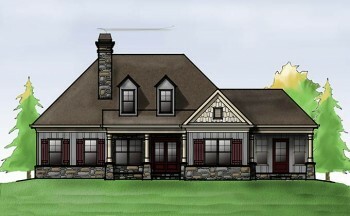 The rear elevation features two screened porches, an open deck and a covered patio across the rear of the house. The exterior features timber brackets and details. A mixture of stone and cedar shake connect the Camp Stone to it’s natural surroundings. The Camp Stone plan works great as a mountain or a lake home.